An analysis of searches and queries can tell you a lot about the knowledge topics which are of the greatest value in your organisation. Analysing patterns of searches helps you to identify the emergent knowledge topics, the knowledge gaps, and the “hot potatoes” in your organisation, your community, or in society. 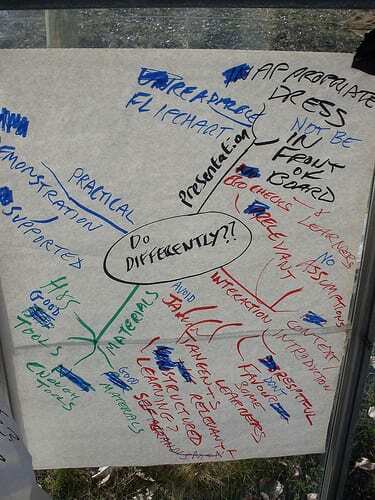 We tried this approach by analysing questions within a big community of practice . The queries to the community forum were already characterised into topics, because when you ask a question using the forum software, you have to choose which topic it is related to. So that saved us having to assign categories. 2. Lots of questions, lots of answers. These were the important and evolving Knowledge topics where it was worth while setting up community meetings such as Knowledge Exchanges so that we could start to exchange and document best practice. This was a very useful analysis and led to a greater understanding of the important evolving and problem topics within the community. If you want a learning organisation, you need an organisation of learners. But what makes a good learner? Here’s an article called “Seven Characteristics of Good Learners” by Maryellen Weimer, which addresses just that question. Good learners are curious – They wonder about all sorts of things, often about things way beyond their areas of expertise. They love the discovery part of learning. Good learners pursue understanding diligently – A few things may come easily to learners but most knowledge arrives after effort, and good learners are willing to put in the time to seek and to find. Good learners are persistent. They don’t give up easily. 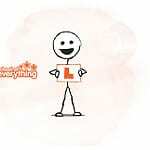 Good learners recognise that a lot of learning isn’t fun – That doesn’t change how much they love learning. Learning is hard work sometimes, but when understanding finally comes, when they get it, when all the pieces fit together, that is one special thrill. Failure frightens good learners, but they know it’s beneficial – It’s a part of learning that offers special opportunities that aren’t there when success comes quickly and without failure. In the presence of repeated failure and seeming futility, good learners carry on, confident that they’ll figure it out. Good learners make knowledge their own – This is about making the new knowledge fit with what the learner already knows, not making it mean whatever the learner wants. Good learners change their knowledge structures in order to accommodate what they are learning. Good learners never run out of questions – There’s always more to know. Good learners are never satisfied with how much they know about anything. They are pulled around by questions—the ones they still can’t answer, or can only answer part way, or the ones without very good answers. Good learners share what they’ve learned – Good learners are teachers committed to sharing with others what they’ve learned. They write about it, and talk about it. Good learners can explain what they know in ways that make sense to others. They aren’t trapped by specialised language. They can translate, paraphrase, and find examples that make what they know meaningful to other learners. They are connected to the knowledge passed on to them and committed to leaving what they’ve learned with others. An organisation of such people would be a powerful learning organisation indeed. The question “If you were to do this again, what would you do differently next time” is an excellent question to provoke reflection. It is a question that we use all the time in After Action Review and Retrospect, but it is one that you otherwise rarely hear at work, and almost never hear raised at conferences. But if someone is asked “what would you do differently”, you can’t answer with history; you have to answer with analysis and with insights. The progression from Observations (“What we did and what happened”) to Insights (“This is why things happened he way they did”) to Lessons (“This is what I would do next time”) is a process of analysis, and needs t be driven by questions – either questions from a facilitator or a third party, or by self-questioning. History is not knowledge. It is analysis of history – reflection on history – that creates knowledge. We need to ask, not just “what did you do”, but also “with reflection, what would you do differently” if we are to get a true knowledge. 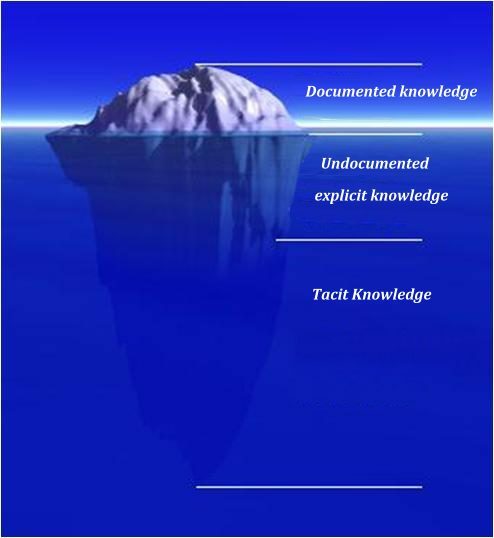 The Iceberg is a very familiar model within Knowledge Management, seen in many slide presentations. I first used it myself in the public domain, in an article in Knowledge management magazine, 2000, entitled “Mining the deep knowledge – tapping into things you don’t know you know” (contact me through comments for a reprint) and I have re-used it many times over the last couple of decades. However deeper down, out of sight, lies the vast mass of unconscious tacit knowledge; the bulk of the iceberg. This knowledge is invisible, inaccessible, and easily overlooked. These are the things that people don’t necessarily know that they know – the unknown knowns – and this is very often the deep-lying technical knowledge and mastery that is of real value to others. Much as data may need to be mined out of documents to be useful, so the unconscious knowledge needs to be mined out of the human brain before it can be made conscious and explicit, and then (if necessary) documented. This “brain mining” is a skill, which can be learnt and taught, but it is primarily a human activity that cannot be automated. It is however the highest value step in the entire spectrum of knowledge management activity. Reaching the Deep Knowledge often requires the help of a facilitator or interviewer, and there is a tell-tale sign that shows when you get there. Superficial knowledge transfer happens all the time. A foreman leaves his job. The company arranges a hand-over meeting, and the foreman talks through the processes and procedures with his successor, but the real knowledge – the tips of the trade, the workarounds, the instinctive feel for the tasks – leaves with the man. An engineer opens his email, and reads a request for advice from a colleague on another continent. The engineer drafts a quick reply, describing a solution he has applied in the past. However he fails to think through the reasoning and insights underlying the solution, and his reply is superficial and of little value to his colleague. The colleague gets no help from the suggestions, and next time she won’t even bother to ask. A project manager finishes her project. She sits down for a couple of days and writes a close-out report, where she details the history of the project, and the successes this project has achieved. But she never gets to the secrets behind the success; these are hidden in the undocumented interactions in her team. As a result, the successes are unrepeated. In each of these examples, an opportunity to exchange valuable knowledge has been lost – in some cases forever. The crucial knowledge stays in the head of the foreman, the project manager, the engineer, because none of them are conscious of what they know. Without being conscious of what they know, they have no way to pass that knowledge on. Any knowledge management system that fails to find the things that people don’t know they know (the unknown knowns), that fails to mine the deep knowledge, will fail to deliver it’s full potential. 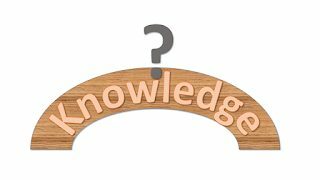 One of the key tenets of Knowledge Management is that we know more than we realise, and more than we can record. The individual, working alone and with a blank sheet of paper, seldom accesses the deep knowledge, and you end up recording the superficial. The only way to dig a bit deeper (while still realising we won’t get everything) is to start probing with questions. A good questioner, or a good questioning process, can help the individual dig deeper than they can manage unaided. That’s why so many Knowledge Management processes are based on questioning and dialogue. On a short-term small scale, the After Action Review is a questioning process; getting at the ground truth behind the results of an exercise or activity. The team’s expectation of an event is compared with the actuality, and the facilitator goes through a questioning process to find the reasons for the difference between the two. Where there is a difference, there is learning, but it may take some probing questioning to get to the knowledge. Oil companies use After Action Reviews in situations where a small team conducts a brief action, such as a maintenance team working a shift at a refinery, or a negotiation team conducting a difficult meeting with a host government. In every case we found that the quality of the questioning determined the value of the knowledge. Superficial questioning gives shallow knowledge of limited use. Harder questioning, maybe using the technique of ‘the five whys’, gets at the deep knowledge, where the real value lies. On a larger scale, the Learning History uses the same sort of questioning techniques. A skilled facilitator, informed but detached, not a member of the team, will take a project team through a structured questioning and discussion process, where the history of the project is reviewed and the knowledge brought out and captured. For example, I was once part of a joint interview team, charged with capturing and packaging the knowledge from a major industrial merger. We targeted 40 of the top decision-makers, and sent them an interview guide with some high-level questions. We then followed this up with hour-long interviews, where we applied some of these questioning techniques. It was pretty obvious when we started to tap into the unconscious knowledge – the pace of the interview slowed as the interviewees started to really think deeply about what had happened, and started to ask themselves ‘what really happened there, and what did we really learn?’. You know, as an interviewer, when you are tapping into the deep knowledge. The interviewee stops, thinks, leans back in their chair, and their gaze rises as they look upwards and inwards. That’s the sign that you are digging deep – the sign that you are hitting Knowledge Paydirt! 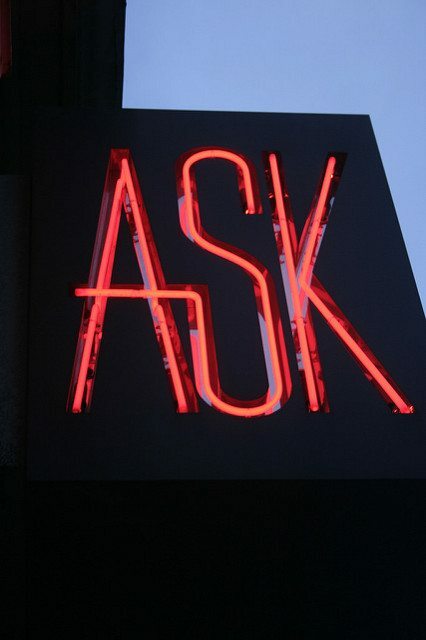 Most knowledge sharing in our private lives is driven by Asking. Let’s use this in work as well. Think about the last time you shared knowledge with one of your friends or family. Maybe it was this morning, or yesterday – maybe you shared advice, a tip or hint, or something you had found out that the other person did not know. I bet you shared this knowledge bacause you were asked. “Are you doing anything tonight”? That’s the way that private knowledge sharing seems to work; it follows the three rules below. So how do we take these principles into the workplace? 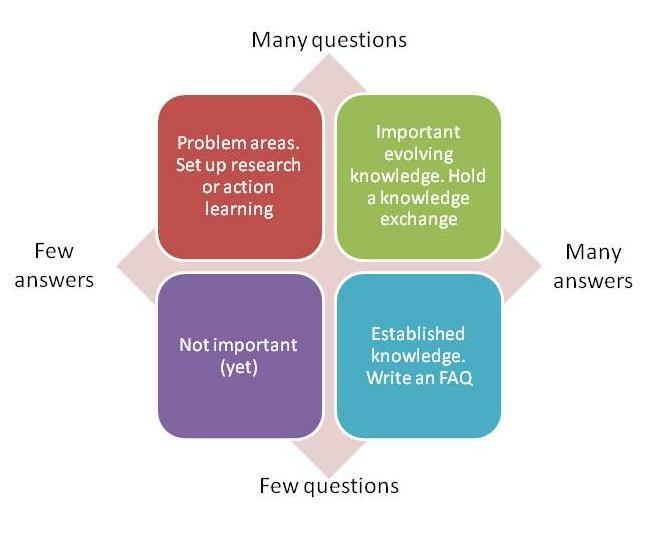 There are several ways in which you can introducing Asking as part of a Knowledge Management framework. The third example is in end-of-project Retrospects. Here the questioning is led by an experienced external facilitator. The process is an asking process – structured, quality assured, and aimed at answering (in advance) the likely questions from future projects.